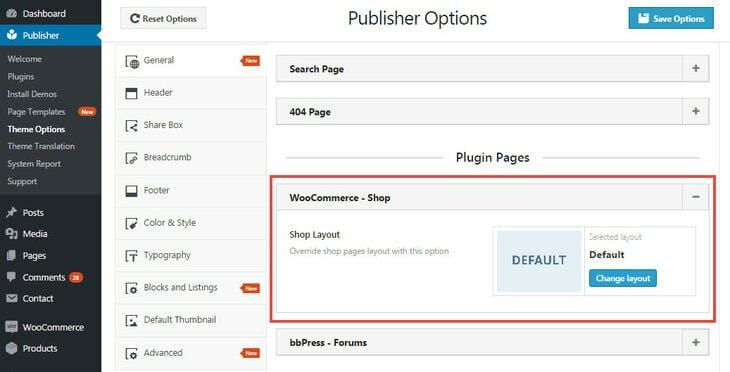 You can select page layout for WooCommerce shop pages in Publisher. For this purpose go to Publisher → General → Plugin Pages → WooCommerce. Here you can select a layout for your shop pages. Also it is possible to override it in every single product page. Go to Products → All Products, now edit the product you want. Scroll down to find Product Options meta box. Here you can customize layout of this very product just like the way you did it Publisher options (see above).